In a real-life scenario straight out of The Silence of the Lambs, Robert Keppel went one-on-one with the notorious serial killer Ted Bundy, who advised Keppel on the detective's highly publicized search for the elusive Green River Killer. Bundy's chilling revelations were chronicled in The Riverman, "a page-turner" (Ted Montgomery, Detroit News) praised by Ann Rule as "the definitive book on serials." 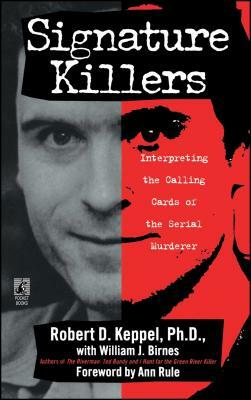 But Ted Bundy wasn't the first killer of his kind -- or the last. They leave telltale identifiers, their gruesome "calling cards," at the scenes of their crimes. They are driven by a primitive motivation to act out the same brutality over and over. With brilliant detection, high-tech analysis -- and a little luck -- they can be caught. But what does the signature killer seek from victim to victim? The answers are hidden among the grisly evidence, the common threads that link each devastating act. Sparked by a growing concern over the steady rise of signature murders, Robert Keppel explores in unflinching detail the monstrous patterns, sadistic compulsions, and depraved motives of this breed of killer. From the Lonely Hearts Killer who hunted the most desperate of women in 1950s America, to the savage Midtown Torso Murders that stunned the NYPD, to such infamous symbols of evil as Jeffrey Dahmer, Ted Bundy, and John Gacy, these are the cases -- horrifying, graphic and unforgettable -- that Keppel ingeniously taps to shed light on the darkest corners of the pathological mind. Robert D. Keppel was the chief consultant to the Green River Murders Task force who helped develop the strategy behind the arrest of current suspect Gary Ridgway. He has since retired as the chief criminal investigator for the Washington State Attorney General's Office. He has received a number of grants from the U.S. Bureau of Justice Administration to aid local police agencies in tracking serial homicides.